The unstoppable Piven and Borgenicht are at it again, producing another in the seemingly endless series of ""Worst-Case Scenario"" books. This time, the authors turn their attention to the potentially disastrous holiday season, and the result is more or less the same-an entertaining quick read in the bookstore aisle. To be fair, though, this volume does contain some interesting information: for instance, it's good to know how to extinguish a burning turkey, put out a grease fire, drive in a blizzard, handle a canceled flight, ""repurpose"" a fruitcake, and resize a Christmas tree. 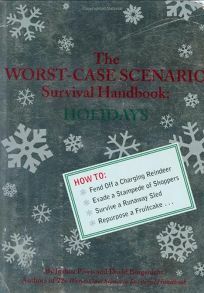 Some readers will welcome this addition to the Worst-Case family, as the books make reliable all-purpose gifts and their oddball advice (how to dodge an angry reindeer, how to ""thwart gift snoopers"") is always good for a few chuckles. Those who've reached their saturation point with the genre, though, may very well wonder when someone will release a book explaining how to repurpose one of Piven and Borgenicht's ubiquitous guides.